Concertzender Outlook on this week’s musical headlines, with the CD of the week, the concert agenda and interviews. Presented by Stef Lokin. This Wednesday, 12 December, between 15.00 and 17.00 flamenco guitarist Jeff Heijne will be playing on our programme. Jeff studied with Eric Vaarzon Morel at the Conservatorium van Amsterdam. Jeff will play three of his own compositions, which can also be found on his new CD; La Niebla se Levanta (the mist clears away), Reflejos del Alma (reflections of the soul), Bulería. Martin Fondse is our guest and he will be bringing along his new CD “Many Faces of Jazz”. On Monday 17 December at 19.00, a new series will start at the Concertzender featuring Catalan gambist and conductor Jordi Savall. On 16 December 2018 the exhibition ‘Utrecht, Caravaggio and Europe’ was launched at the Centraal Museum, which is why during the episode of 17 December we will focus on the CD ‘Lachrimae Caravaggio’ by Jordi Savall. The series has been compiled by: Johan Le Févre. 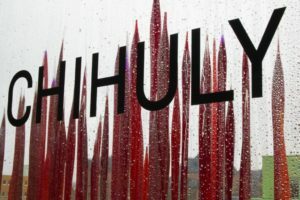 Works of American artist / glass sculptor Dale Chihuly. Now until 5 May 2019. Music: Glass Music from and performed by the Global Guaranty Orchestra.